The original MIL-Spec "Drop-In" Ambidextrous Magazine Release for the M16 Family of weapons including the M4 Carbine, AR-15, and Colt® 9mm Carbine. Enables user to execute three different magazine release methods on each side of the weapon.Design properties reduce the possibility of inadvertent release. Can be disassembled for cleaning and maintenance. Click the page below to download a document which describes the magazine release methods. This was and still is the most elegant, simple, and functional product to come along for the standard M16 lower for "Commercial Off the Shelf" (COTS) improvements for the left-handed (so in certain parts of the Corps the "affliction/sickness/southpaw"). God bless the Corps for allowing commanders the opportunity to authorize this simple improvement for the small percentage of lefties. Being left handed can be tough sometimes but the Norgon Ambi-Catch is a blessing for super fast reloads better easier utilization of the weapon controls. The Norgon catch allows me to quickly drop a magazine with my trigger finger and the spring tension is just right to prevent an accidental magazine release. The Norgon catch also works great in the S&W M&P 15-22 polymer lower. Love this product. Gives full control of my weapon, even being a lefty. Will buy again, for my 308. I installed the Norgon Ambi-Catch as part of a WWSD build for a customer, and loved it so much (I'm a left-handed shooter) that I bought one for myself on my new AR-15 build and will be sure to include one in every build that I make personally, and highly recommend it to any left-handed shooter, customer or friend. As a U.S. Marine, we love acronyms - especially K.I.S.S. : Keep It Simple, Stupid. The Norgon Ambi-catch is K.I.S.S. exemplified, as it is without a doubt THE BEST ambidextrous magazine release setup on the market today. It is extremely well designed and made, with an OE mil-spec look and feel, while having very few parts to operate properly. It's definitely "Marine Proof" and I will be adding one to every AR-15 rifle I own! Not sure what there is to review that hasn't already been covered elsewhere. BLUF - They work as advertised without extra protrusions to snag on gear or accidentally release the magazines. Having a military background and knowing something about some of the units using them, buying the Ambi-Catch for personal use was a no-brainer. The best part was discovering the direct purchase option. The first two from reputable retailers were more expensive and took forever to ship. I've got four now and will continue purchasing direct as I gradually upgrade the rest of my collection. Somewhere Gene Stoner is saying "Why didn't I think of that?" This thing installs the same as the factory part, takes up the same space, and doubles the functionality. It's pure simple indestructible genius. I'm ordering my third one. I love this Ambi-Catch and have many of them installed in my builds. I only use the Norgon as it works, looks great, fits, easy to install, and does the job very well! Well worth the money, as I once bought a cheap knock-off...it was JUNK! This product is rock solid. I installed it in two minutes on a Sabre Defence AR-15 and I am really impressed with the fit and finish of this product. I am ambidextrous so when I build an M4 or other AR-15 type rifle, I build them to be as ambidextrous as practical. I have tried every ambidextrous magazine catch available and I like the Norgon Ambi-Catch the best. My only criticism for the Ambi-Catch is, when wearing gloves, the Ambi-Catch can make it difficult to use the bolt catch to lock the bolt open. Releasing the bolt is no problem. I am currently trying a Seekins Precision Enhanced Bolt Catch with an extended tab to make it easier to lock the bolt open with a gloved hand. 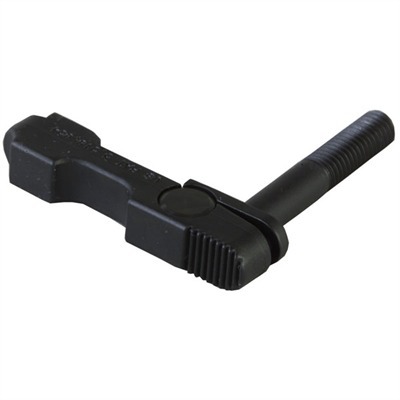 Strike industries Enhanced Bolt Catch and the Geissele Maritime Bolt Catch are other possible solutions. Works as described. Easy to install. Easier to install if you use their ambi-catch tool. I have several of these installed with no issues. Will continue to purchase. I purchased my 1st Ambi-Catch with my left handed son in mind but soon found out that I’m very pleased with the option of using the mag release myself from the drivers side of my AR. The install ....very easy and the function is top notch as well. Very pleased with my 1st purchase and that is the reason I installed 4 more in the rest of my primary tools. Copyright © Norgon, LLC. All Rights Reserved.